Meek Mill was sentenced to 2-4 years in prison today when a Philadelphia judge ruled that he violated his probation. JAY-Z have now shared a note on Facebook decrying the sentence. “The sentence handed down by the Judge—against the recommendation of the Assistant District Attorney and Probation Officer—is unjust and heavy handed,” he wrote. 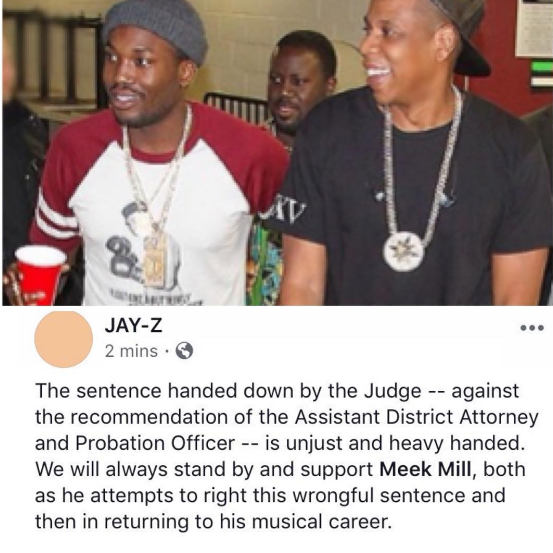 “We will always stand by and support Meek Mill, both as he attempts to right this wrongful sentence and then in returning to his musical career.” he wrote.